On Friday, February 15, a Senate of Canada Clerk contacted Community Sector Council of Nova Scotia Executive Director Arlene MacDonald to ask if Arlene would provide witness testimony before the Special Senate Committee on the Charitable Sector. As noted on The Senate of Canada website, The Senate has ordered the Special Senate Committee on the Charitable Sector to “[e]xamine the impact of federal and provincial laws and policies governing charities, nonprofit organizations, foundations, and other similar groups; and to examine the impact of the voluntary sector in Canada”. Arlene was asked to apply a youth focus. Recommendation 1: That the Special Committee encourage the Federal Government to continue the development of a Youth Policy for Canada. Recommendation 2: That the Special Committee encourage the Federal Government to provide sustainable support to new or existing organizations who offer youth service, youth employment and volunteering opportunities. Recommendation 5: That the Special Committee encourage the federal government to provide Statistics Canada with a clear mandate and the financial resources (estimated at no more than $1 million per year) to collect, analyze, and disseminate data about the social purpose sector. Recommendation 6: That the Special Committee encourage the federal government to work with the social purpose sector to identify and implement machinery of government changes so that the long-term health and vitality of the sector are an integral part of the federal policy-and decision-making process. “I’d do it again,” Arlene noted, and commented upon how engaged committee members were. She received a number of thoughtful questions. 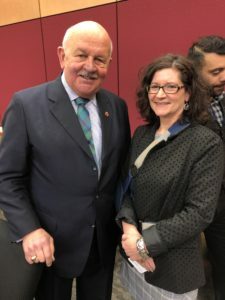 Arlene is pictured below with the Committee Chair, The Honourable Senator Terry Mercer. The full video clip from the day’s proceedings can be viewed here. Evidence from the February 25 Meeting can be read here.